I really have a problem with naming the animals that we are ultimately going to eat. My husband insists on naming them so that we can tell them apart. We welcomed two new additions to our homestead this winter. 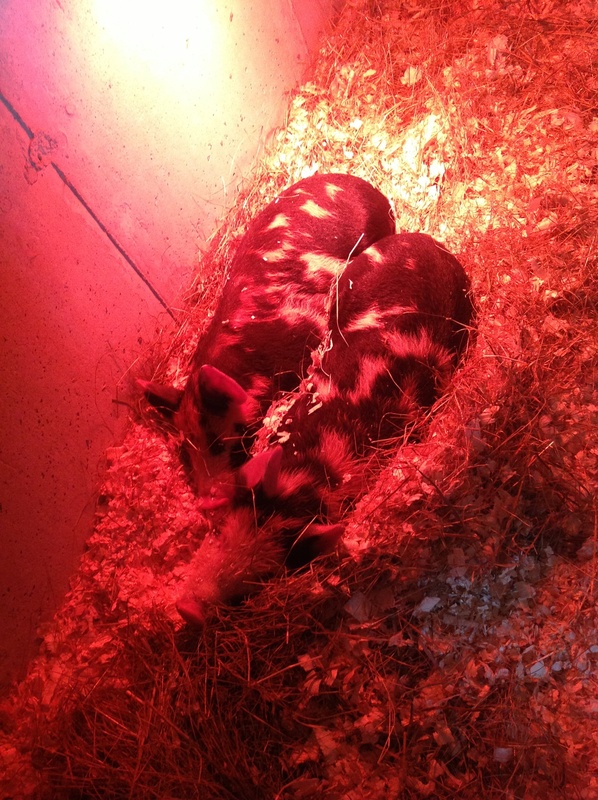 Two Tamsworth/Berkshire crossed piglets. We gave them the name Big pig and Little pig. We couldn’t have acquired them on a colder day and although they were used to the cold, we moved them into our garage until the temperature gets a little warmer. Our ducks have decided that the nice little pen that we made for the pigs is a great place to hang out as well and have also moved in. Needless to say there is no room in my garage for my car. We decided to get this type of piglet so they will turn our soil in the Springtime. This breed is suppose to be good for rooting and with our clay like soil we decided we can use all the help we can get. It will be interesting to see how they mesh with our other farm yard animals. Since I last updated we have decided to take 4 turkeys, 3 ducks and 50 chickens through the winter. They live amongst the 50plus rabbits that we have and thus far have been doing quite well. It surprises me that they really do better in the winter compared to the summer. I think I will take some pictures and do a follow up on our tee pee style shelters. We really are hoping for breeding to take place with our turkeys and ducks. Been spending a lot of the days planning for Spring. My son is hoping to start his own adventure in farming by raising some meat chickens. We are hoping to turn our huge pens into productive gardens. Every day I still shake my head and wonder what it is that we are doing. Why we are choosing to put so much added stress in our lives. But glad that we are almost through winter and my freezer is still full and my pantry is as well. It’s now the middle of February and we are gradually getting the pigs ready for their transition back into the outdoos. The sun is peaking its head out finally so I do feel Spring is just around the corner. I will be busy later making pots to start my Spring garden. I must admit that although I do like having all the transplants in the Spring, I hate having all the transplants in my house until the Spring.